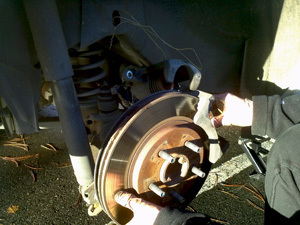 If you've been planning on doing a 2005 Mustang rear brake replacement, or on a 2006 or newer car, a few minutes of your time to learn about the new Mustang's rear brakes will save you time and money. 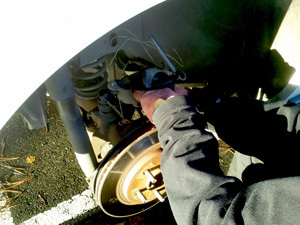 While the rear caliper, rotor and pads seem to be your garden variety rear disc brake setup, there is one issue that can cause you a lot of grief, if you don't know it's there. Pulling the emergency brake handle on your Mustang's console causes the cable to operate a bracket/mechanism attached to your rear caliper and causes the rear brake piston to push your brake pads against the rotor. 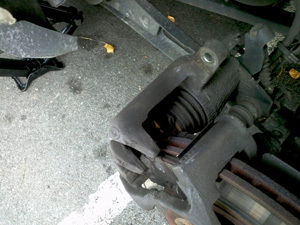 Because this type of e-brake has no automatic adjustment, normal brake lining wear and tear could, over time, cause the distance the piston must travel to increase to the point that your emergency brake won't operate. 1. 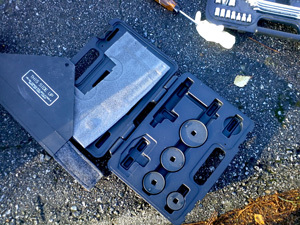 Get a multi plate rear caliper piston rotating tool, which locks itself against the caliper on the outer casting side and screws the piston in (clockwise) through the tool's middle access hole. 2. 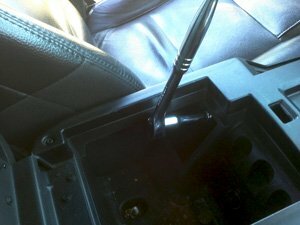 Make sure that the emergency brake is disengaged by loosening the e-brake cable at the console or it won't allow the piston retracting tool to screw the piston deep enough to get in your new pads. 3. 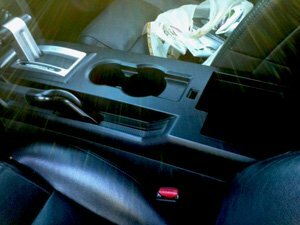 Find the cable adjuster by opening the console storage/package tray and finding the small rectangular access hole. 4. Use a 10 mm deep socket and short 3/8 " extension and loosen the nut that adjusts the cable tension until it is near the end of the threaded rod's length. 5. Place the car in Park or 1st gear. 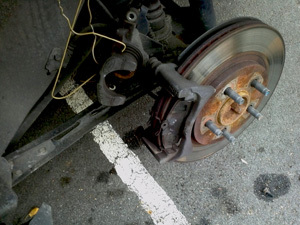 Jack up the rear of the car on one side, blocking the opposite front tire and remove the wheel. 7. Use a coat hanger or bungee cord to hang the caliper. 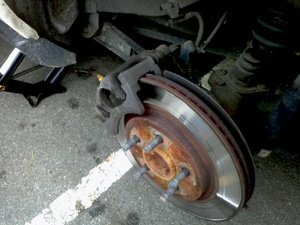 Failure to do this can allow the caliper to pull against the brake hose, causing a split internally which, when brakes are applied, can act like a one way check valve, locking the brake in the on position causing a very dangerous situation. 8. Insert the caliper piston adjustment tool. There are several kinds of these tools. Don't use the universal "block" style" tool (as seen above) it's listed for emergency brake piston adjustment, which sounds right, but won't work on your 2005 Mustang rear brake replacement. You can either use the factory Ford special tool 206-026, or buy one of the universal rear brake piston tools as seen in the above picture. They range from about $45 on up to $250 for professional quality units. Contrary to what my local auto parts store guy tried to tell me, these universal emergency brake piston tools that you see below are not designed for the 2005 Ford Mustang Emergency brake piston. Although they look like they might just fit, they won't work on your 2005, 2006,2007,2008 or newer Mustang. 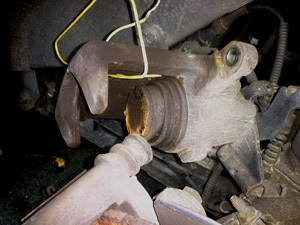 Using a standard "C" clamp as you would on most front brake calipers to retract the piston can cause permanent damage to the piston and caliper and will not make the piston move inward and instead of a nice simple 2005 Mustang rear brake replacement you will be instead performing a caliper replacement. 9. While supporting the caliper against the rotor or while someone holds it, use a 3/8" drive wrench and long extension, turn the adjuster tool clockwise, screwing the piston inward until it is flush with the rubber piston seal. If you have trouble turning the piston inward (clockwise) make absolutely sure you have disengaged the hand brake AND haven't cranked the adjuster tool too tight. Note: every three or four turns will require tightening up the threaded part of the tool to keep it flush against the opposite wall of the inside of the caliper. If you need to replace the rotor, it's now a simple matter of pulling it off the wheel studs and replacing it. 10. Once the piston has been retracted, insert the new rear brake pads into their slots in the caliper support housing and carefully place the caliper over them. 11. Fit the two caliper bolts into their holes and torque them per factory specs. 12. Replace the rear wheels and set the brake pistons, by moving your Mustang back and forth, applying the brakes to stop it. You will feel the difference when the pistons have "set" into the correct position. 13. 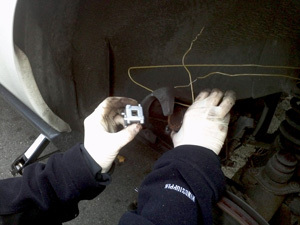 Drive and adjust the parking brake cable using the 10mm deep socket. That's it! You're done your 2005 Mustang rear brake replacement. Wasn't that easy?